A seasoned ground turkey patty served on a whole wheat bun with maple and pepper lacquered turkey bacon, herbed goat cheese, wilted endive and a sweet and rich pumpkin and garlic aioli. Combine all ingredients and whisk until smooth. Reserve refrigerated. Combine maple syrup and black pepper. Place turkey bacon on a wire baking rack over a parchment lined sheet pan and bake in a 350°F oven for approximately 8 minutes or until beginning to crisp. Remove from oven and brush with maple and pepper mixture, and continue to bake for another 6-8 minutes until crispy and caramelized. Hold hot for service. Pick the leaves from the endive, removing the thick, woody bases, yielding approximately 10 leaves per head. Lightly sauté in olive oil until beginning to wilt and add the vinegar to briefly steam. Season to taste with salt, drain any excess liquid, and reserve refrigerated. Combine all ingredients and mix well to incorporate. Form into 10 patties. Reserve refrigerated. Grill the turkey patties to 165F. 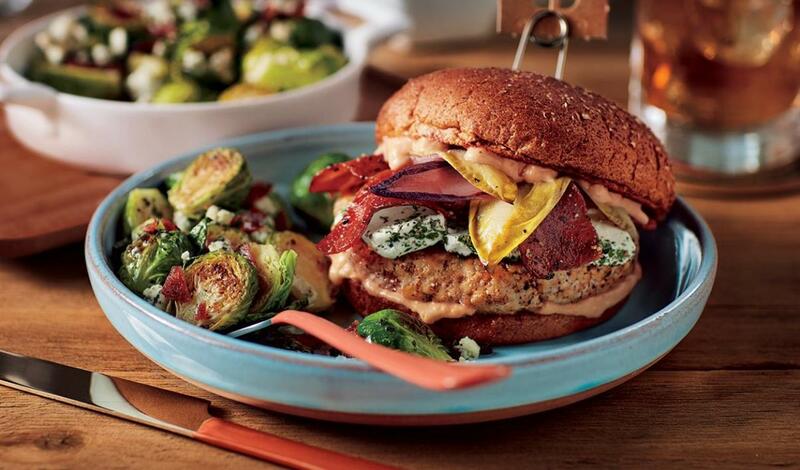 To assemble, spread 1 Tbsp Pumpkin Mayonnaise on each side of the bun, then add grilled Seasoned Turkey Patty and herbed goat cheese. Top with two slices of Maple Bacon and 3-4 leaves of the Wilted Endive, depending on size. Serve.